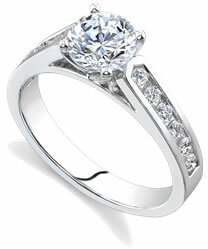 Many people are starting to favor the fancy, vivid colored diamonds over the traditional transparent, or white, diamond. Some diamonds are found in their natural colors when they are mined, others become colored by gemologists and jewelers during a treatment process. In order to make them more affordable to the average consumer, companies have begun color-treating diamonds of lower grades in order to take a less desirable yellow or brownish tinted diamond and make it into a beautiful, brightly colored diamond. Colored diamonds can be treated by a process called irradiation, which uses a high heat system to alter the color of the diamond. Other diamonds are treated by painting. While many diamonds are inspected and valued based on their colorless qualities, there are people who prefer the fancy colored diamonds that come in vivid hues of greens, yellows, reds, pinks and all the different colors in between. Some colored diamonds are that way naturally. If a diamond has nitrogen in it, it often has a yellow tint to the stone. If the gemstone has been effected by radiation, the gem may turn green. Other colored diamonds have been treated to obtain their colo, and this allows people with lower budgets to purchase the fancy colored diamonds. Gemologists have found ways to alter the colors of diamonds to get any shade or hue desired. The grading process for colored diamonds is slightly different than that of the transparent diamond. First, a colored diamond is graded based on the primary hue, the blue or pink or red color that makes up the majority of the diamond's color. Second, they are graded based on the intensity of that color. A very intense, naturally colored diamond is more rare than a less intense diamond, and therefore more expensive. A treated diamond will cost less than a naturally colored diamond in most instances. Most diamonds are found and mined by miners, but more recently, scientists have come up with ways to create synthetic diamonds. While a synthetic diamond is still a “real diamond”, they are created within a laboratory instead of by nature in a mine. Because fancy colored diamonds come in so many different shades, it can sometimes be difficult to interpret the name of the diamonds color. Often, you'll find two colors labeling the shade of a diamond, such as greenish blue. Each name has a primary color description, and some have a secondary color description. If a diamond is called “blue diamond,” you can tell it will be a blue shaded diamond gemstone. If the diamond is called “greenish blue,” you may wonder what that means. Is the diamond blue, or is it green? The color that is described with the “ish” at the end is considered the secondary color and the other color, in this case blue, is the primary color. So, a greenish blue diamond is mostly blue, with specks of green seen throughout the stone. If you come upon a diamond labeled “brown red” then the diamond will have equal amounts of both colors seen through the stone.